What’s new for the 2019 General Assembly? Along with our conference organisers, Copernicus, we aim to improve the experience of General Assembly attendees with each passing year. Over the last few months we’ve introduced some changes that we hope will make the 2019 edition of our meeting even better! This post highlights the new rules for submitting an abstract and some changes that returning participants will notice at next year’s conference. An ever-growing number of participants means making sure that all participants at the EGU annual General Assembly are able to present their work in a comfortable manner in the years to come. One of the measures adopted to ensure all presentations (orals, posters and PICOs) find a place is the introduction of the one-abstract rule. Authors are allowed as first author to submit either one regular abstract plus one abstract solicited by a convener, or two solicited abstracts. A second regular abstract can be submitted to the Educational and Outreach Sessions (EOS) programme group (maximum number of abstracts, including solicited abstracts, remains two). Possible submissions for first authors are: 1 regular + 1 solicited abstract; or 2 solicited abstracts; or 1 regular or solicited abstract + 1 EOSabstract (regular or solicited). Note that authors will need to provide a transaction number (TAN) when submitting their additional solicited abstract. This TAN has to be provided by the convener. Participants can be co-authors on additional abstracts in which they are not first author. Another change for the EGU General Assembly 2019 is that only 2019 EGU members will be able to submit an abstract as first authors (co-authors are not required to have a membership). You can become a member or renew your membership online on the EGU website (www.egu.eu/membership/) or while registering for the General Assembly. Students receive a 50% discount in their EGU membership rates, and all EGU members benefit from substantially reduced registration rates to the meeting, amongst other benefits. More information on these new abstract submission rules are available on EGU’s call-for-abstracts announcement. The scheduling of the conference programme will also see some changes at the upcoming General Assembly. 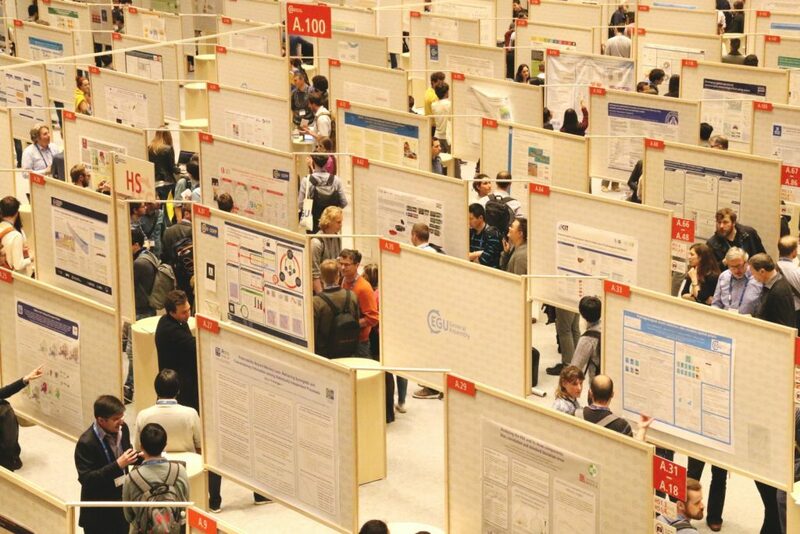 The new schedule features posters, orals and PICOs throughout the day, uses time blocks of 105 minutes, and includes a dedicated networking slot. Note that posters and orals of the same session will not be scheduled at the same time. This schedule change will allow us to fit more oral presentations in the meeting, give more viewing time for posters and PICOs, and provide a more comfortable meeting experience for all. A dedicated networking slot will give attendees additional time to discuss and interact with colleagues, to view posters and to visit the exhibition. More information and a detailed time schedule are in the EGU news item. Finally, we are taking steps to make the General Assembly greener. Last year we implemented a number of initiatives to reduce the environmental impact of the meeting, including giving participants the opportunity to offset the CO2 emissions resulting from their travel to and from Vienna. People who used this option while registering contributed to a project to reduce deforestation in Brazil. As a result of this initiative we raised nearly €17,000 for the carbon offsetting scheme! We’re striving to add further measures for 2019, so stay tuned to the EGU blog and website for further details on new green initiatives. We look forward to seeing you in Vienna! EGU 2019 will take place from 07 to 12 April 2019 in Vienna, Austria. For more information on the General Assembly, see the EGU 2019 website and follow us on Twitter (#EGU19 is the official conference hashtag) and Facebook. In honour of Roland Schlich, who was instrumental in the formation of EGU, the travel awards will, from now on, be known as the Roland Schlich travel support scheme. Roland passed away in 2016 and was executive secretary (2002–2004), treasurer (2005–2015), as well as one of the founders of the Union. Financial support includes a waiver of the registration fee and a refund of the Abstract Processing Charge (relating to the abstract for which support was requested). Additionally, the grant may include support for travel expenditures, at the discretion of the Support Selection Committee, to a maximum of €300. The EGU currently runs two different Roland Schlich travel support schemes: Early Career Scientist’s Travel Support (ECSTS) and Established Scientist’s Travel Support (ESTS); you will be able to find more details about each of these awards on the Support & Distinction section on the EGU 2019 website. You will also find details on who is eligible for the awards on the website. Scientists who wish to apply for financial support should submit an abstract, on which they are the contact author, as well as the first and presenting author, by 1 December 2018, 13:00 CET. Late applications, or applications where the scientist is not the main author, will not be considered. The EGU Support Selection Committee will make its decision to support individual contributions by 20 December 2018. All applicants will be informed after the decision via email in late December or January. Only the granted amount mentioned in the financial support email will be paid out to the supported contact author. Please note that, as of 2017, a participant can receive a maximum of two ECSTS and two ESTS during their career. In other words, applicants who have received two travel supports in a category in the past are not eligible to apply for that category again. The abstract submission page (click for larger). If you wish to apply for financial support, please select the relevant support box. To submit the abstract of your oral or poster presentation, please enter the call-for-abstracts page on the EGU 2019 website, select the part of the programme you would like to submit an abstract to, and study the respective session list. Each session shows the link to Abstract Submission that you should use. More information on how to submit an abstract is available from the EGU 2019 website. Applying for financial support is easier than ever! As soon as you make your choice of session you will be prompted to select whether you wish to apply for financial support. If you do, be sure you tick the appropriate box when submitting your abstract. Bear in mind that, even if you are applying for support, you will still need to pay the Abstract Processing Charge. A screenshot of the abstract submission process is shown above. If you have any questions about applying for financial support for the 2019 General Assembly, please contact Olivia Trani (EGU Communications Officer). Join us at the EGU 2019 General Assembly: Call for abstracts is now open! From now, up until 10 January 2019, you can submit your abstract for the upcoming EGU General Assembly (EGU 2019). In addition to established scientists, PhD students and other early career researchers are welcome to submit abstracts to present their research at the conference. Further, the EGU encourages undergraduate and master students to submit abstracts on their dissertations or final-year projects. The EGU recognises that there are many outstanding students who would benefit from attending and presenting at the General Assembly and, therefore, provides a discounted registration rate to this group. Interested undergraduates can apply to present a poster, talk or PICO presentation on research undertaken in a laboratory setting, on a mapping or field project they’ve been involved in during their degrees, or any other research project of relevance. 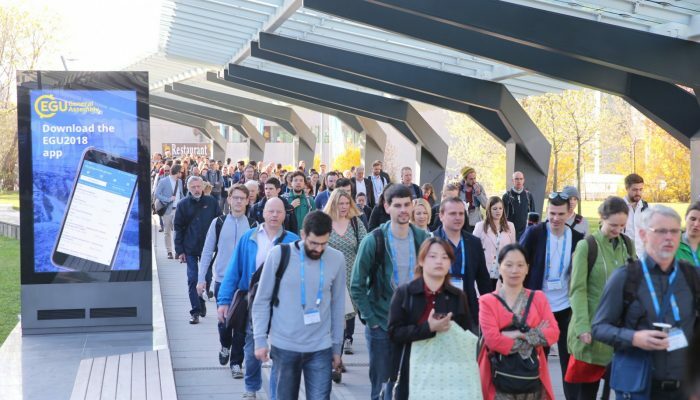 Browse through the EGU 2019 sessions. Clicking on ‘Please select’ will allow you to search for sessions by programme groups and submit your abstract to the relevant session either as plain text, LaTeX, or a MS Word document. Further guidelines on how to submit an abstract are available on the EGU 2019 website. An innovative presentation format – Presenting Interactive Content, better known as PICO – has been implemented at the General Assembly since 2013. PICO sessions bring together the advantages of both oral and poster sessions, allowing authors to present the essence of their work and follow it up with interactive discussion. Please note that some sessions are ‘PICO only’ sessions, meaning you cannot select oral/poster preference. If you are submitting to a PICO only session be sure to check out our PICO guide, for tips on how to prepare your presentation. The deadline for the receipt of abstracts is 10 January 2019, 13:00 CET. If you would like to apply for financial support, called the Roland Schlich travel support, to attend the 2019 General Assembly, please submit an application no later than 1 December 2018. We’ll be providing further information about how to apply for travel grants and how they are awarded in a forthcoming post. 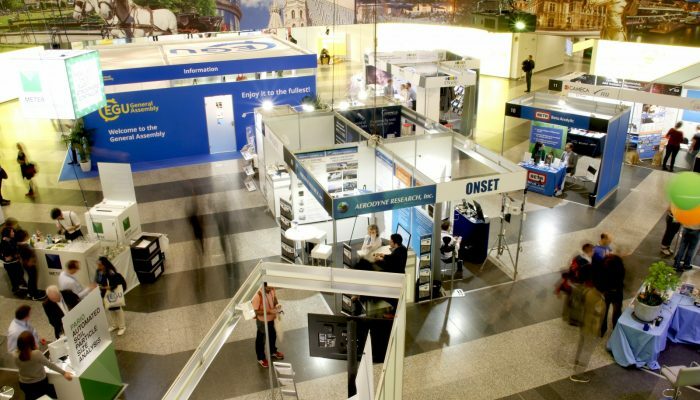 EGU 2019 will take place from 7 to 12 April 2019 in Vienna, Austria. For more information on the General Assembly, see the EGU 2019 website and follow us on Twitter (#EGU19 is the official conference hashtag) and Facebook. NB: We strongly recommend booking accommodation for the 2019 General Assembly as soon as possible. The Vienna City Marathon (40,000 participants) will take place on Sunday, resulting in many hotels being fully booked the night before. From 2005 to 2018, the total amount awarded grew from about €50k to €120k, with 275 awards being allocated to support attendance to the 2017 General Assembly, representing a 31% application success rate. About 80-90% of the funds are reserved to assist early career scientists in attending the conference, whilst the remaining funds will be allocated to established scientists. The EGU currently runs two different Roland Schlich travel support schemes: Early Career Scientist’s Travel Support (ECSTS) and Established Scientist’s Travel Support (ESTS); you will be able to find more details about each of these awards on the Support & Distinction section on the EGU 2018 website. You will also find details on who is eligible for the awards on the website. Scientists who wish to apply for financial support should submit an abstract, on which they are the contact author, as well as the first and presenting author, by 1 December 2017. Late applications, or applications where the scientist is not the main author, will not be considered. The EGU Support Selection Committee will make its decision to support individual contributions by 22 December 2017. All applicants will be informed after the decision via email in late December or January. Only the granted amount mentioned in the financial support email will be paid out to the supported contact author. To submit the abstract of your oral or poster presentation, please enter the call-for-abstracts page on the EGU2018 website, select the part of the programme you would like to submit an abstract to, and study the respective session list. Each session shows the link to Abstract Submission that you should use. More information on how to submit an abstract is available from the EGU 2018 website. Applying for financial support is easier than ever! As soon as you make your choice of session you will be prompted to select whether you wish to apply for financial support. If you do, be sure you tick the appropriate box when submitting your abstract. Bear in mind that, even if you are applying for support, you will still need to pay the Abstract Processing Charge. A screenshot of the abstract submission process is shown below. If you have any questions about applying for financial support for the 2018 General Assembly, please contact Laura Roberts (EGU Communications Officer).